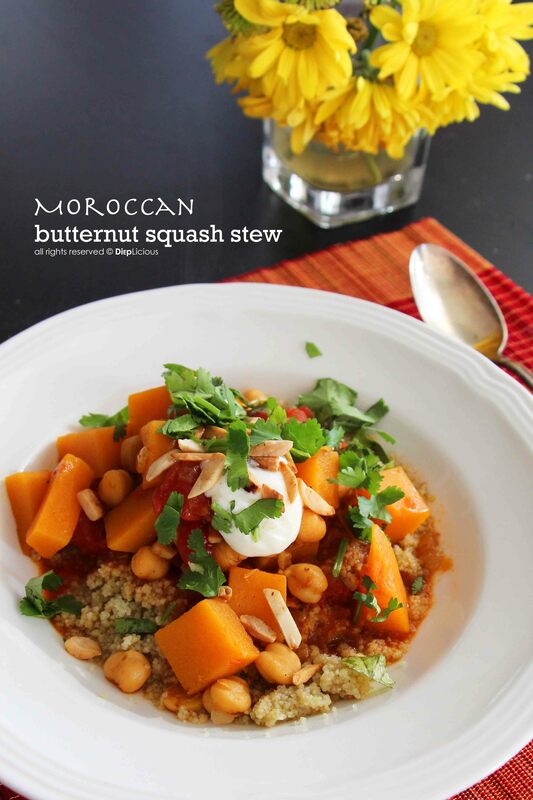 This Moroccan style stew is a wonderful winter dish. It is filled with flavors from the butternut squash and cinnamon, and it happens to be a very healthy vegetarian or vegan dish. The stew can be served with couscous for more authenticity, but I prefer to eat it with bulgur wheat. Couscous tends to absorb the juices and create a porridge consistency, whereas the bulgur maintains its crunchy texture. It is very easy to make. You can use vegetable stock and skip the yogurt for a vegan dish. 1. Heat the olive oil in a heavy-bottomed saucepan or a Dutch oven. Add the onion, garlic and cinnamon, and sauté until translucent (about 4 minutes) and then add the cumin, chili, salt and pepper and sauté for another 2 minutes. 2. Add the squash, and season once again with salt and pepper. Stir to coat and cook for another 3 minutes. 3. Add the broth, chickpeas, tomatoes and their juices, saffron, lemon juice and peel. Cover with a tight fitting lid and reduce the heat to low, and simmer the stew for about 15 minutes or until the butternut squash is fork tender. Season with salt and pepper. 4. Mix the yogurt and lemon juice together in a little bowl. 5. Serve the stew over couscous or bulgur in a bowl, and top with the lemon yogurt, toasted almonds, and cilantro. 1. Peel the skin off the butternut squash. Cut it in half right were the curve starts, so you have a "top" and "bottom" part. 2. Cut the "top" part into 1-inch thick long strips (lengthwise from top-to-bottom) and then cut them into cubes. 3. For the "bottom" part, remove the bottom end piece and toss away. Cut in half (lengthwise from top-to-bottom) through the center, and remove the seeds with a spoon. Then cut the two parts lengthwise into wedges, making long strips (including the curve line from the squash) and finally cut them into cubes. Stew is always a healthy choice and loved you style and photographs too!! I made this last night and it was awesome! Bulgar wheat was a good choice as the grain. We had the leftovers for dinner tonight and after leaving the cinnamon stick in overnight it was even better. I am very happy that you enjoyed this dish and it is even better knowing the fact that it is super healthy. I made this tonight but I put a sweet potatoes with butternut squash, chickpeas, And added kidney beans dark and kale OMG.